I have seen hexagons floating around on the blogs for some time now...I am a little late on that bandwagon.... but these are fun to make and a bit addicting! There will be 3 more rows added to this one....I quickly figured out how to do them so they fit together a little better than this one....it is a bit goopy in the corner....BTW don't you love that fabric in the background? Now back to work on the NYB....and then the QAL.....and then the Eloise Quilt.....geesh, I really need another project!!!! Oh my gosh!! These are lovely!! 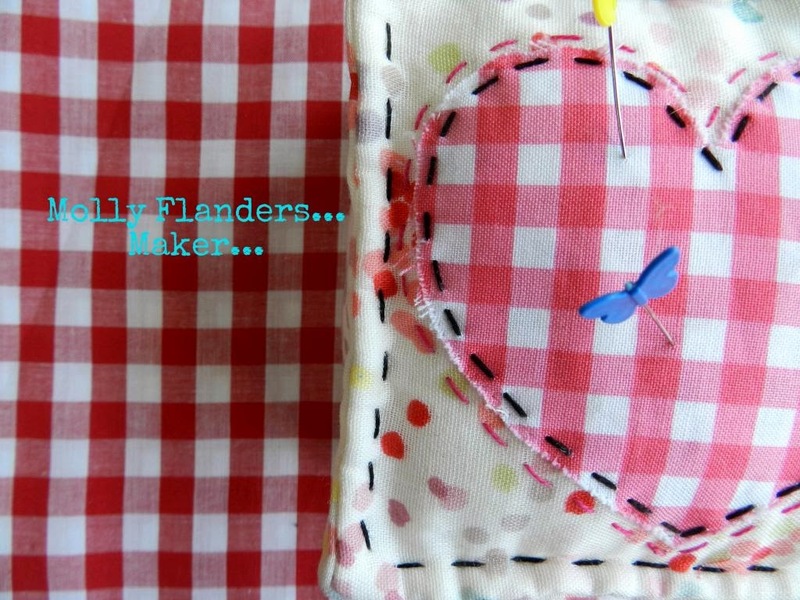 I really heart the second one :) Best wishes with this hand pieced project!! Good luck with yours, it's beautiful so far! The Grandmas Flower Garden tugs at my heart too. I started a large multi hexagon (was going to be a quilt,but now will turn into a table runner...smile). I would love to make the flowers though and piece the hexagons that way. Your flowers are precious and yes, I do love that background fabric! :o) Too cute. Hey those are cute but I have just finished two handsewn tops and am not looking for another yet - but some day...some day I will. I look forward to seeing your progress! Welcome to the bandwagon, Mary! You might be riding for awhile, but it will be worth it, I'm sure. It already looks pretty! i think I'm going to make a flower garden quilt as my next hexagon quilt - such a great portable project! And so cute in modern fabrics. Grandmother's Flower Garden is the all time favorite in my world. Yours will be beautiful. I found a wonderful hand pieced top at a thrift store. I just need to figure out how to finish it. (Or have it finished...)? Your fussy cut hexagons are darling. The lifetime quilt will be a cherished treasure for sure!! Great take along project!! Beautiful! I started a hexy table runner last summer, thinking it would be a lifetime project. It turned into a full-sized quilt top by the fall! You might be surprised...you might have a lot of gorgeous "lifetimes" done in your life time! I started a GMFG quilt last year and have loved working on it in the evenings. So calming. Welcome to the club! I'm going to cheer you on, the quilt in the photo is the exact rendition that I fell for ages ago and filed in the brain. I think it's the wee diamonds between the flowers that I love. Have fun! It will be a special project, Molly! I am working on a quilt like this. Like you, I thought it will take me forever to complete it so I asked for help! I will make the quilt for my mother and my three sisters help me! I so love the grandmother's flower garden quilt. I have been trying to talk my mom into making all the little hexagons instead of sitting and crocheting all day. But, she's not going to do it so I guess I will have to. I know what you mean about a lifetime quilt, but oh, it will be so worth it when it is finished.